Even some eighteen months later, there’s a faint air of unreality about the recovery of The Enemy of the World and The Web of Fear. Maybe this is because the notion of complete (or nearly complete) stories returning to the archives seemed to be such a remote possibility. Yes, it had happened back in 1992 with Tomb, but as time went on that appeared to be a miraculous one off. Post-Tomb, we’d become conditioned that the small (but very welcome) trickle of orphaned episodes would be all we could ever expect. The recovery of these nine episodes changed that though and it allows us to reassess a substantial chunk of season five. For most people, including myself, viewing these two stories was a very different experience from watching The Tomb of the Cybermen back in 1992. Tomb might have been a legendary lost story, but in 1992 I didn’t even have a complete collection of the existing episodes (although I was well on the way). So Tomb was just another story and I approached it with none of the baggage that some older fans would have had. Enemy and Web were very different. I’d had the orphaned episodes for twenty five years and the audios for nearly as long. So the small amount of existing visual material and the audio of the remaining episodes were very familiar – meaning that finally being able to put pictures to the sounds was an exciting, if slightly nerve-wracking experience, first time around. This was Barry Letts’ first brush with the series and it’s apt that episode one features both a hovercraft and a helicopter, given that the Pertwee era would show a similar love of hardware. The opening ten minutes or so are mostly shot on film and they help to give the story a glossy, expansive start. As a first-time director on the show, Letts was clearly keen to push as far as he could and there’s some impressive shots (such as the POV from the helicopter showing Anton and Rod firing as it pulls away) that maybe a more experienced (or jaded) director wouldn’t have bothered with. The early minutes are peppered with some lovely visual moments – such as the Doctor stripping down to his long-johns to take a dip in the ocean. This emphases the Troughton Doctor’s child-like nature although he’s also quick to sense that the approaching hovercraft means them harm (although this seems to be via a sixth sense as there’s no visual clue). The hovercraft is piloted by Anton (Henry Stamper), Rod (Rhys McConnochie) and Curly (Simon Cain). It’s Anton who gets the lion’s share of their dialogue, although sadly it’s not particularly memorable and Stamper’s unsubtle delivery doesn’t help. Thankfully, all three are put out of our misery shortly afterwards. The Doctor, Jamie and Victoria are rescued by Astrid (Mary Peach). Our first sight of Astrid is from the rear and it’s easy to believe that this was a deliberate shot-choice from Letts as Ms Peach does have a rather attractive derriere. Certainly something for the dads there! But although it’s impossible to deny that Astrid is an objectified figure right from the start, she’s also a strong, capable woman at a time when that was still something of a rarity in Doctor Who. 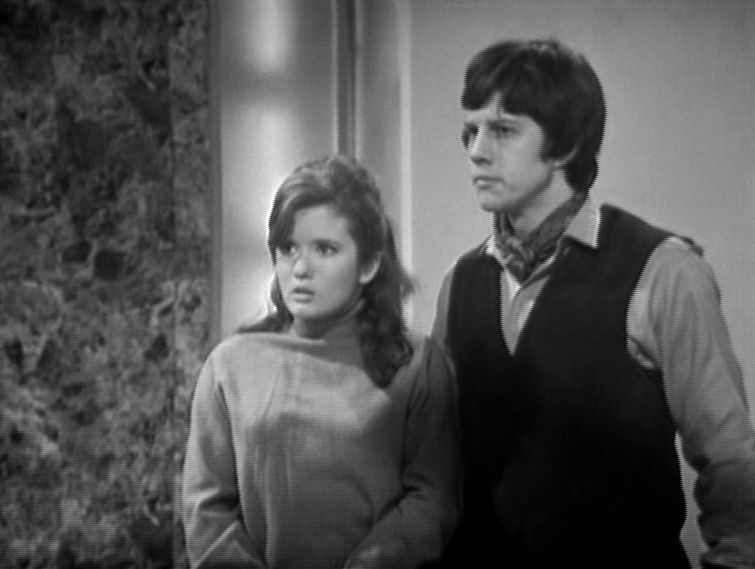 There are other examples in the Troughton era – Anne Travers in the next story and Gia Kelly in The Seeds of Death, for example – but they were still the exception rather than the rule. After the Doctor attended to a flesh-wound she picked up during their escape, she begins to delicately pump him for information. Once she learns he’s a Doctor, Astrid wonders in what field, possibly law or philosophy. Troughton’s reply, with a faint smile playing around his lips, of “which law? Whose philosophies, eh?” is another of those lovely moments that only works when you have the visuals to match up to the soundtrack. And it does make you wonder just how many more examples of Troughton’s magic are lost on the audio-only episodes. Another nice moment comes shortly afterwards when she tells the Doctor that he’s “the most wonderful and marvellous man that’s ever dropped out of the skies” and asks if he’ll do something for her. The Doctor’s quite taken with her compliment and dreamily tells her that, yes, he will. But he’s brought up sharply when Astrid tells him it’ll probably cost him his life! It’s a gag moment, as it’s impossible to believe that the Doctor would ever be taken in by such a cheap piece of flattery, but it’s still amusing. What happens next is interesting. The Doctor seems reluctant to meet with Astrid’s boss, Giles Kent (Bill Kerr) and wishes to leave. It’s Jamie who for reasons unknown (perhaps he fancies Astrid?) tries to persuade him to stay. The Doctor’s inaction during the story was mainly for practical reasons – an episode could either largely feature Troughton as the Doctor or as Salamander, but it would be hard to do both. So the Doctor had to drop out of the narrative for a few episodes in order for Salamander to dominate. Therefore, if the Doctor had agreed to the impersonation straight away, then the story would have been over much sooner. There could be another reason though – since the story was scripted by David Whitaker, the show’s original script editor, whose view of the series was very different from those who came after (especially Dennis Spooner). Something very consistent in the Whitaker script-edited stories is that the Doctor never decides to stay and help purely out of a sense of moral duty (instead it’s generally because he’s unable to leave – the TARDIS is taken by Marco Polo, the lock of the TARDIS is stolen in The Sensorites, the TARDIS is trapped by a fallen girder in The Dalek Invasion of Earth, etc). It’s therefore quite reasonable for Whitaker to script a Doctor who’s reluctant to act. This is unusual for the series at this time though, where the Doctor is generally quite happy to pitch in straight away. But it’s an interesting move, as whilst Giles Kent is very convincing in painting Salamander as a villain, there’s little actual evidence to back this up. For anybody familiar with the parameters of the series to date, it would seem clear that Salamander = Bad and Giles = Good. As we’ll see though, things aren’t quite as clear cut and this is an early example of the series taking a more pessimistic world-view where few, if any people, can be trusted. Possibly the best example of this is The Caves of Androzani which must be unique in lacking any characters (outside of the regulars) that could be said to be wholly “good”. But even this early on, we have clear evidence that Kent is a ruthless manipulator. He wants the Doctor to impersonate Salamander but obviously knows that he’ll take a great deal of persuading. So he contacts Salamander’s head of security Donald Bruce (Colin Douglas). Since they’re implacable enemies, quite what he says is something of a mystery, but Bruce turns up shortly afterwards and Kent gives the Doctor an ultimatum. He has to impersonate Salamander and he has to be good enough to fool Bruce, otherwise the lives of Jamie and Victoria will be forfeit.